What is a radio earpiece? An earpiece as the name suggests is a piece for the ear that can either be put inside the ear, covering it or suspended next to the ear. Its main function is to transmit sound signals converted from electronic waves. Earpieces can either be wired or wireless and with a variety of designs as well. Radio earpieces are convenient; especially where the user is constantly on the move. They are stylish and whether they have a cord or not are still presentable and handy. They too have special microphones that enable two way communications. A light inline push to talk button is as well present and it can be detached or attached to the earpiece. You can have one that is over the ear that is usually quite fitting. It can either be circum-aural whereby it covers the entire ear and is usually large or supra-aural which only fits on the ear without surrounding it. For these radio earpieces to be of good quality, the material needs to be flexible to reduce chances of breakage. Other features of the different earpiece designs include having reinforcements aimed at making them more secure. You can also choose to have a wireless or corded radio micro phone that works just as well. Some of the covert earpieces will come with their own separate cables of different lengths and easily adjustable volumes. An earpiece that is fitted inside the canal of the outer ear can also be referred to as an ear bud. A good radio ear bud will not have any negative effect in your ear functioning. It also needs to be comfortable for the wearer. The one with a sound tube connector is even more secure and makes a perfect fit into the ear. The radio earpiece will also come with wire pieces if one decides to use them. One can in addition have more than one connector with a single radio earpiece. These acoustic tubes will also come with mushroom replacements. An earpiece worn inside the ear canal will obstruct external sounds unlike the ear bud. It is also possible to have a radio transmitter over the ear that ensures that you get clear and quality sound without influence from the noise in the background. The microphones are also able to reduce the sound in the environment and focus on what needs to be transmitted. Over the ear earpieces come in a number of interesting designs such as the D shaped and the G shaped radio earpieces which are especially favorable if the earpiece is being used by more than one person. They are not only sanitary for sharing but comfortable too. Sometimes it will just seem like one is simply listening to their radio but the earpiece is a great communication tool as well. Most of its advantages are drawn from its unique features. A radio earpiece comes in handy especially because if it’s small size and its hidden nature. You can easily keep your conversation over the radio private and no one will even know you are on it. This is especially when the information being passed is on a need to know basis. This makes it the earpiece appropriate for those working under cover, security agents, and police officers or even by the government. It is also good for any other occupation or activity that needs a high amount of secrecy or those involving investigations. Another important feature of the earpiece is its ability to enable free flow of information within that particular time. This communication makes it very helpful in such circumstances when one needs to be regularly updated while performing a particular task. This can be because they need to be given instructions or need to be informed about the progress of something. 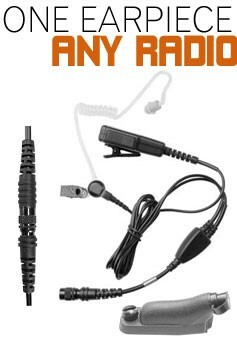 However, this in combination with the private and convert properties of the radio earpiece also makes it the perfect device for more sinister motives such as illegal spying or cheat in a game or even a test. On the positive side, this communication is extremely helpful in public speaking when one needs some pointers while on stage or in front of an audience without having the listeners know about it. Being hands free and portable makes it possible for them to be used in occupations where holding a radio to communicate is not an option. This is for instance in works involving heights or need a lot of precision such as engineering or doing a delicate electrical project. You are very welcome to quote or use our articles. The only condition is that you provide a direct link to this article on the page where you quote us.